On the first day of spring, activists from Jackson heights East Asian community, labor organizations, and various other community groups braved the snow for the March edition of the spring into Action Film Series. This latest screening was hosted by the New York Taxi Worker alliance in Long Island City and drew parallels between garment workers from the era of Triangle Shirtwaist and Bangladeshi workers now. This series is part of a collaboration between the Workers Unite Film Festival and The Workmen’s Circle, a hundred year old progressive Jewish social and labor rights organization. These screenings are all building up to the big film festival which goes from May 6th until May 22nd. Both groups have united this spring and will continue during the May festival. 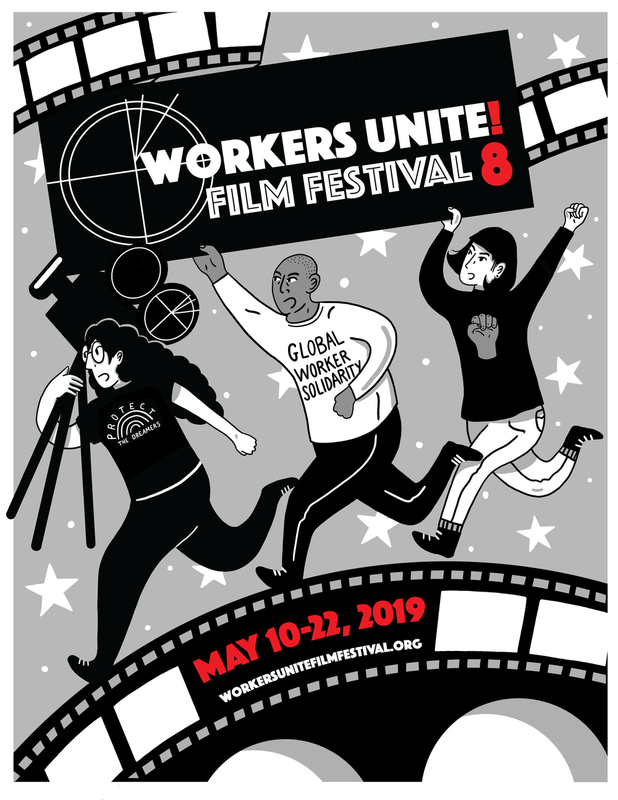 They will screen and publicize films dealing with issues connected to worker’s rights and labor union struggles, both in the U.S. as well as all over the world. Both groups strongly believe in the need for global labor and worker solidarity. On March 20th one of the films screened was a short film portraying the ongoing fight of fast food workers for a living wage, the film was called “Fight For $15.” The film depicts how workers are pushing to force hugely profitable companies, such as McDonalds, to pay all there workers a living wage of at least $15 an hour. The film shows how the movement has grown to encompass home health care aides, airport workers and all workers suffering the indignity of working fulltime who are still not able to pay for basic necessities of life. These groups are aiming towards a huge national day of action on 4/15/15, with demonstrations and walkouts all over the country. We strongly support them. We then saw a short film called Tangled Thread which was introduced by Sara Ziff the director of the film and is executive director of the Model’s Alliance. After the murder of a labor organizer in Bangladesh and the collapse of the Rana Plaza complex in Bangladesh, Ziff was compelled collaborate with Kalpona Akter, director of the Bangladesh Garment Workers Union. Ziff feels strongly that all workers exploited by the global fashion industry need to unite to stop unjust practices and demand safe and dignified working conditions for all workers. Tangled Thread is another step in bringing together garment workers and models to show that they stand in solidarity for better global work conditions. Continuing the focus on Rana Plaza, we saw Tears in the Fabric, film from a series of works by The Rainbow Collective, from the UK. The film was developed based on their five years in Bangladesh documenting the struggles of exploited workers who are fighting for fair wages, safe working conditions and dignity on the job. Tears in the Fabric, covers the period immediately after the Rana Plaza collapse, until over a year later. The film details the unfathomable human toll of nearly 1200 innocent worker’s lives lost due simply to greed on the part of the factories. It also shows how even today, companies like Children’s Place, still will not pay fair compensation to the surviving families of those workers killed on the job. Even as recently as last month, Kalpona Akter was arrested with over 20 activists for simply demanding that the company pay more than $750 US for the loss of life of each worker killed in their sweatshops in Rana Plaza. Finally, we saw a series of three films by an excellent new director out of Pakistan, Ammar Azziz, who is only 27, but has a tremendous vision in telling the stories of working people’s struggles against exploitation. His films, Daughter’s of A Lesser God, Rise of the Oppressed and Diseased City, develop a strong empathy for the plight of young women, children and men who are being exploited. The workers are at the mercy of a system where they must work in very unhealthy and unsafe conditions from ages as young as 6 or 7 in order to help their families scrape by. The powerful news here is that they are now organizing and fighting back against horrendous company owners who see them as expendable cogs in their manufacturing machine. All three films take place in Lahore, Hyderabad and surrounding areas. This May the films will be screened again at the Headquarters of the NY Taxi Worker Alliance, in Jackson Heights and Fresh Meadows in Queens. They will be screened in association with the wonderful Runner newspaper and Millenium TV as well as several local community groups. Thanks so much to Bhairavi Desai Executive Director of the NY Taxi Worker Alliance and the NY Taxi Workers Alliance as a whole for letting us use their space. Thank you as well Mr. Syed from the Machinists Union, Ms. Dima Nefartity Executive Editor of The Runner Newspaper and Mr. Mohammad Rashid, Mr. Kausar Mumin, for their kind and gracious support.